Experience the next generation in stadium entertainment. A new era of Tiger-Cats football. Get your tickets at Tim Hortons Field now! 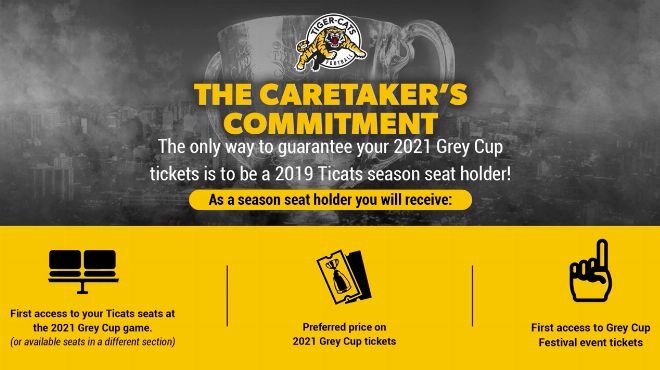 Introducing The Caretaker’s Commitment: The only way to guarantee your 2021 Grey Cup tickets in 2019. Secure the best Grey Cup seats, at a preferred price! Whether you’re a CFL enthusiast, a sports fan or simply a proud Hamiltonian, there’s only one way to guarantee your spot at the big game and jump to the front of the line for 2021 Grey Cup tickets: The Caretaker’s Commitment! So what exactly is The Caretaker’s Commitment? Visit our 2021 Grey Cup page for complete details. 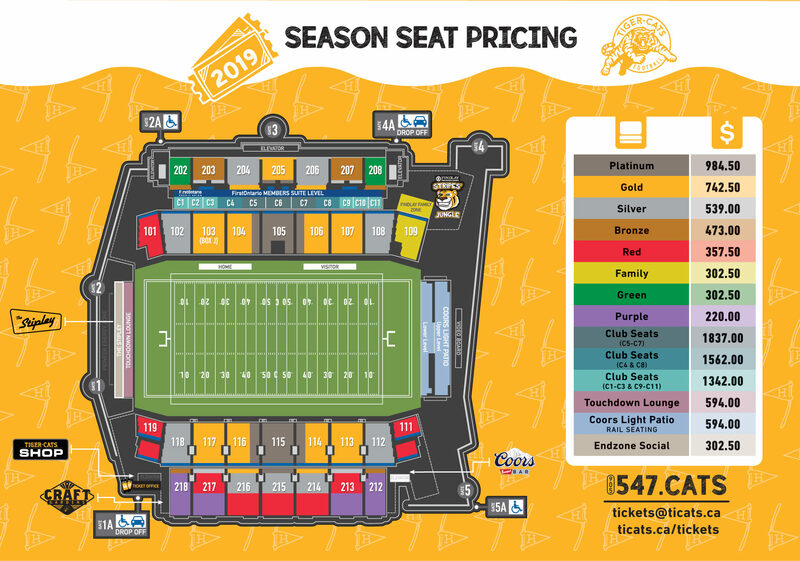 If you have any questions regarding Grey Cup tickets, The Caretaker’s Commitment or 2019 Tiger-Cats season seats, please email tickets@ticats.ca or contact a Tiger-Cats ticket representative at 905-547-2287. New Season Seats - On Sale Now! 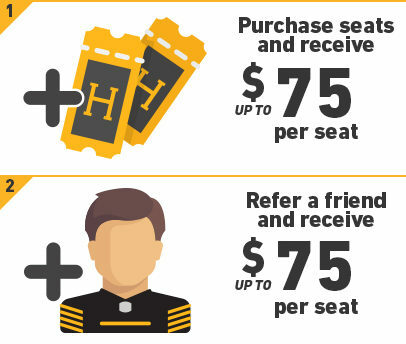 Receive cash back on your Tim Hortons Field merchandise and concessions mobile rewards card, simply for purchasing seats or referring a friend! Learn more about the Members Advantage program in the ‘Members Advantage’ section below! 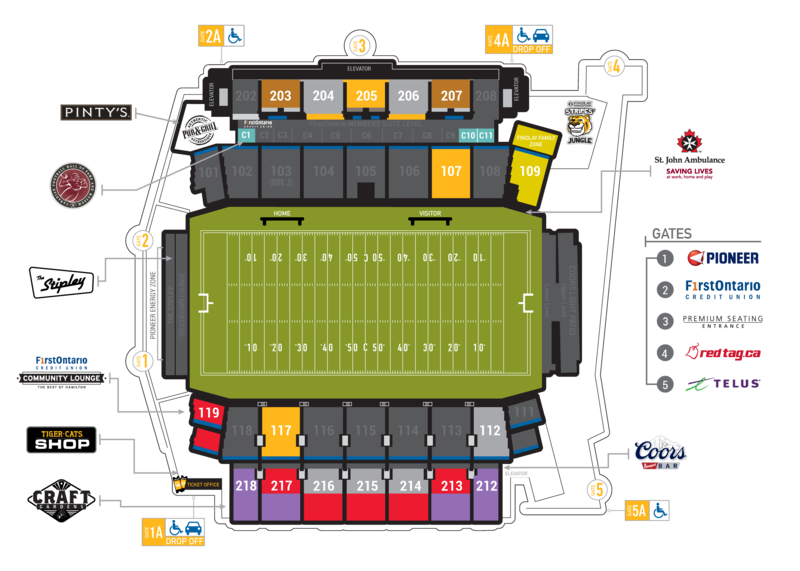 Please contact a Tiger-Cats ticket representative at 905-547-2287 or customerservice@ticats.ca if you have any questions. *Earn up to $75 per seat when you purchase Club Level tickets. **Earn up to $50 per seat when you purchase general bowl tickets. ***Must be a 2019 season seat holder first before taking advantage of refer a friend cash back bonus. As a 2019 season seat holder, you enjoy these benefits and more! Benefits specific to Club Level season seat holders! Refer a friend to buy new 2019 season seats. 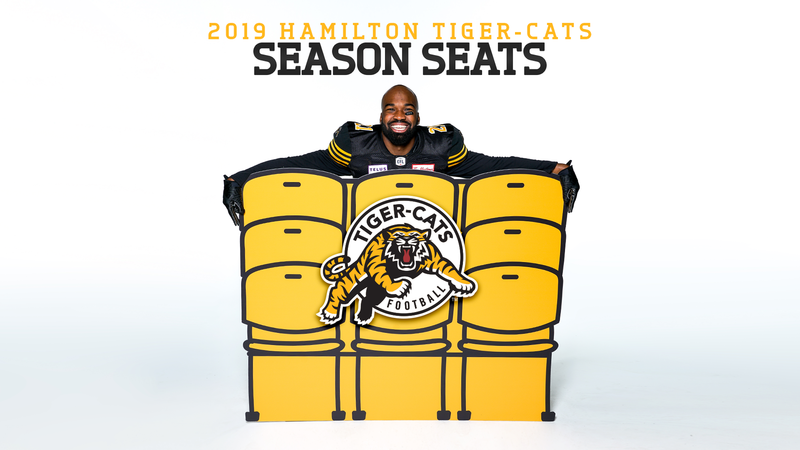 For every seat they purchase, receive up to $75 on a 2019 Tim Hortons Field merchandise and concessions mobile card. Terms and conditions apply. Simply provide the contact information of your friend below and we’ll do the rest. It’s that easy! Three flexible payment plans and a new way to pay for your seats in 2019! Q: After purchasing my seats, when will I receive my digital tickets? A: Your digital tickets will appear on your MyTix Account Manager dashboard beginning in early June 2019. 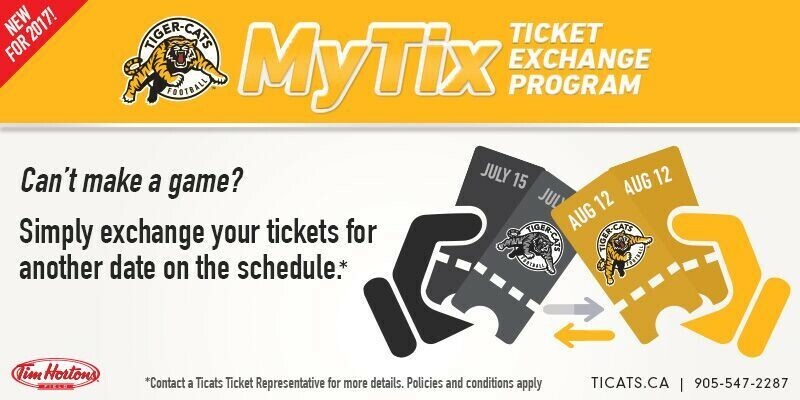 Visit www.ticats.ca/mytix to manage your seats at that time. Q: When do I receive my rewards dollars? 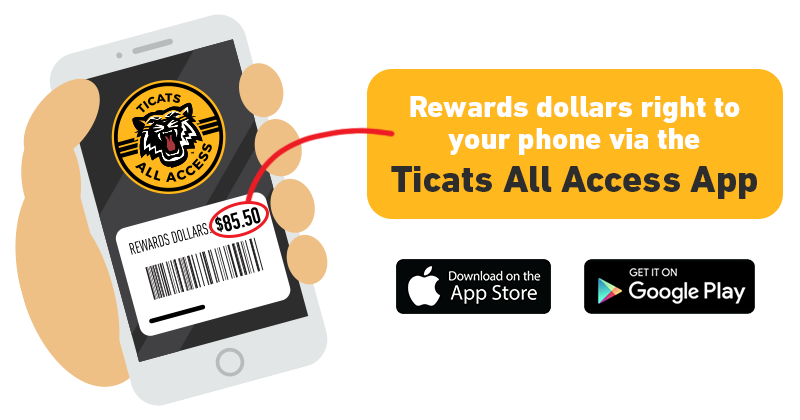 A: You will receive your merchandise and concessions rewards dollars, in the form of a mobile card on your Ticats All Access app, in Spring of 2019 before the season begins. Q: Do my rewards dollars expire? A: Yes, your 2019 rewards dollars expire on December 31, 2019. Spend your rewards dollars at Tim Hortons Field on food and beverage during the season, or at the Tiger-Cats Shop on the newest jerseys and merchandise. Q: Do payment plans have interest? A: The three Tiger-Cats payment plans are interest free. Q: I notice my playoff tickets are included in the price of my season seats. What happens if the Tiger-Cats don’t host a home playoff game in 2019? A: We will credit your account for any home playoff game not played. Celebrating a birthday? Looking for a fun outing with coworkers? Planning a bachelor or bachelorette party? Raising funds for your minor sports team? 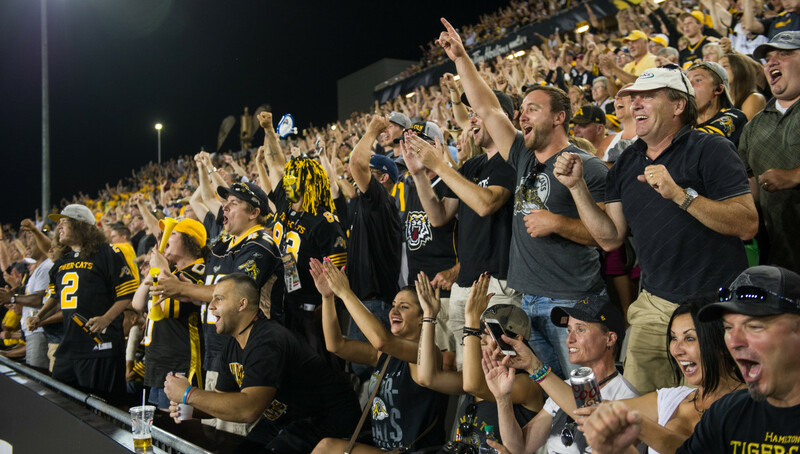 The Tiger-Cats invite you to Tim Hortons Field for an action packed afternoon or evening of family fun, social gathering and unforgettable memories. It’s more than just a football game! Why bring your group to a game? What classifies as a ‘group’? 20 or more people. Larger groups enjoy additional savings and benefits. 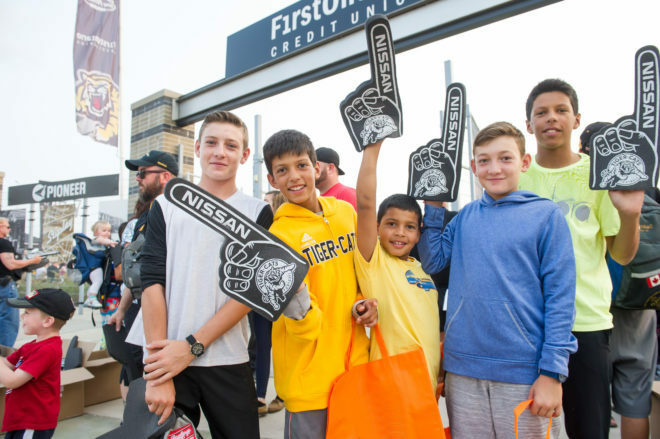 For groups under 20 people, contact us at groups@ticats.ca or 905-547-2287. A group leader or point person to organize tickets and collect payment. For more information, email groups@ticats.ca or call 905-547-CATS! Need help organizing your group? Trying to gather more group members? With Fevo, our free digital group ticket solution, you get a free personalized event page with all of your event details, where your group can purchase tickets and share the event! You save time and effort! It’s simple: The more members in your group, the better the savings on tickets! *Labour Day pricing may vary from above. 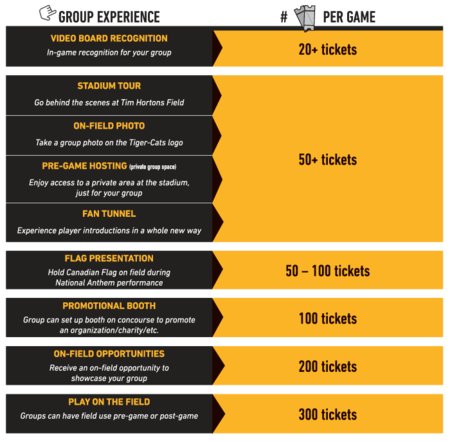 The Tiger-Cats offer a wide variety of group programs, packages and initiatives. Learn more below. Host your group of 20+ and receive up to 30% savings vs. single game prices. Organizing a safe ride home? Planning the world’s greatest bachelor party? 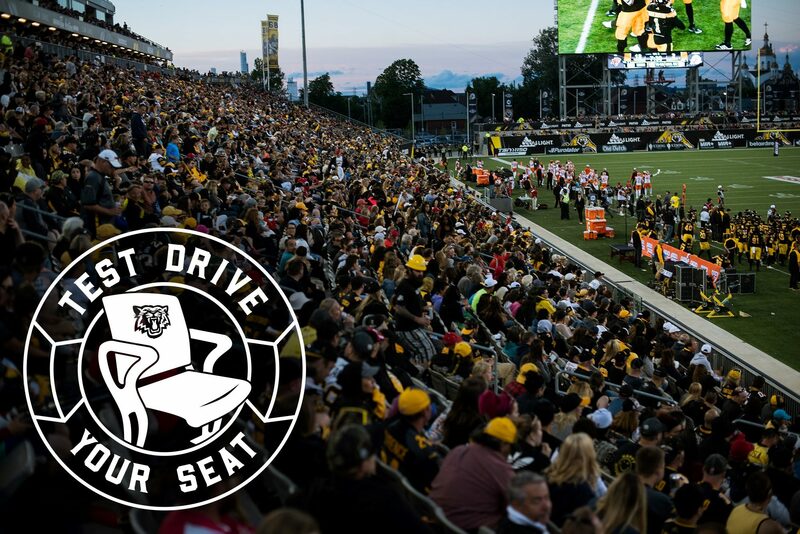 Get a limo ride to and from Tim Hortons Field during Ticats home games! *Subject to availability. Prices vary for Labour Day. 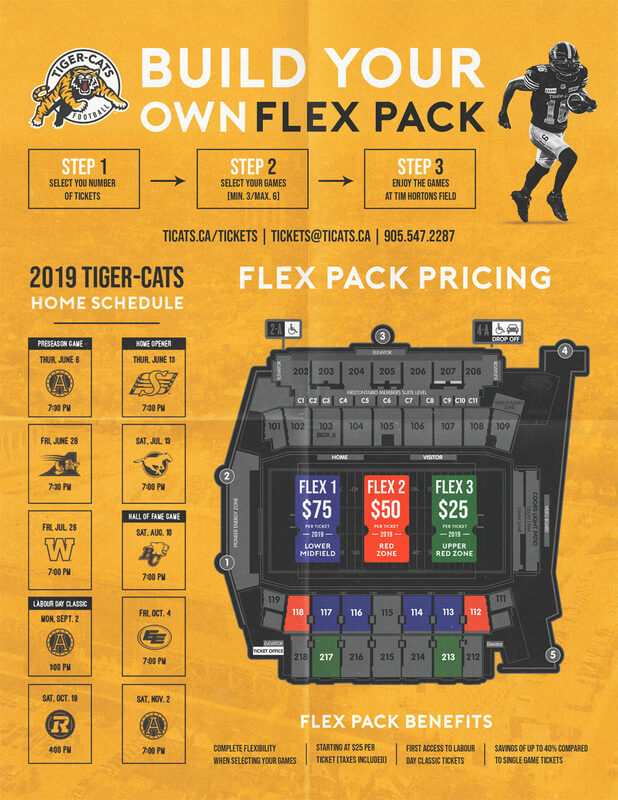 Fundraise your initiative with the help of the Ticats. Simply sell discounted tickets to Ticats games and keep the profit. The more you sell, the more you make. It’s that easy! Step 3: Resell your tickets (up to face value) and keep the profit! Looking for a climate controlled experience with premium amenities for your group? There’s no better place than Tim Hortons Field’s premium seating! Spanning the entire length of the field, the Club Level offers great sightlines of the game and first-class amenities that include a climate control lounge, private entrance, bar service and much more. Home of the Canadian Football Hall of Fame, Club Level features an innovative bistro-style game experience with unique menu options and programming. Club Level delivers an immersive museum experience, at your finger tips at every game. All 296 Hall of Fame busts will be on display, with state-of-the-art digital technology integration and interchangeable displays, showing off hundreds of unique artifacts. Provides a unique setting to host your group of clients, co-workers, family and friends. Call 905-547-2287 for more information on Club Level tickets. Located on the FirstOntario Members Suite Level, our 30 private suites each offer 16 seats on a weather protected balcony, allowing suite owners to experience outstanding views of the game with the ability to comfortably accommodate their guests. Call 905-547-2287 for more information on booking a private suite. Introducing the MyTix Ticket Exchange program for season seat holders! Can’t make it to a home game during the season? We’ll swap your tickets out of a game you can’t attend, and exchange them into another regular season home game on the schedule (not including Labour Day). Beginning in Spring 2019, simply let your ticket representative know a minimum of 10 business days in advance of any regular season home game that you can’t attend, and we’ll swap your seats for a different home game on the schedule. Policies and conditions apply. 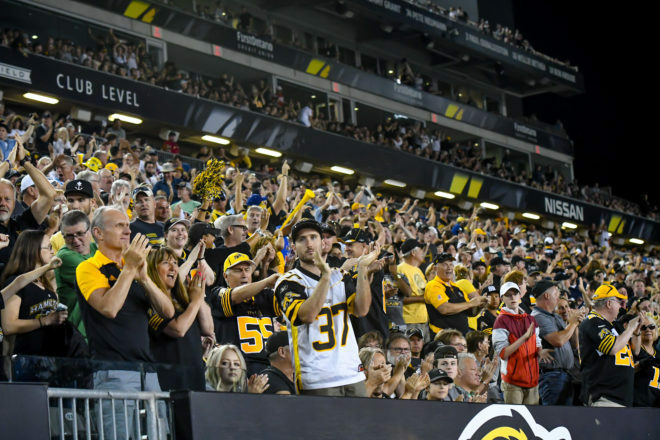 *Ticket management and reallocation will be at the discretion of the Hamilton Tiger-Cats on a first-come, first-served basis while tickets are available. Requests must be made 10 business days before a game. **Fans are not permitted to swap their preseason game tickets for seats at a regular season game. Regular season tickets cannot be exchanged for potential home playoff game tickets. Season seat holders have more flexibility than ever when entering Ticats games at Tim Hortons Field. Simply log in to MyTix Account Manager to view your digital season seats, including options to print, transfer and resell your tickets. Visit www.ticats.ca/digital for more information. Over the phone with one of our ticket representatives at 905-547-2287. In person at the Tiger-Cats head office (1 Jarvis St.) Mon-Fri, 9 a.m. to 5 p.m.